Is this Brisbane's best day trip? Next time I need to suggest to others a day trip easily within reach of Brisbane, but worlds away from the suburbs and the concrete heat, I only have to think of Moreton Island. I'd always known Moreton Island was there, but never quite grasped just how easy it was to get from Brisbane to the world's third largest sand island. From Holt Street Wharf in Pinkenba (just east of the Gateway Bridge) the Tangalooma Express departs at 7am daily, and arrives at Tangalooma Jetty, on Moreton Island's western shore. The Tangalooma Express offers daily return trips from Holt St Wharf for $65 adult and $40 for kids. Includes a $20 resort lunch voucher. Bookings are essential since the boat often fills right up with commuters, day trippers and holidaymakers staying at the Tangalooma Island Resort. For $65 dollars ($40 for kids) we purchased return tickets, which also included a $20 resort lunch voucher – more on that later. After the 70-minute journey on the comfortable catamaran, along shipping lanes and passing shipping cranes of the Port of Brisbane, we docked at the island's jetty. The excitement grew as we saw the enticing and impossibly blue waters lapping at the yellow beach. For those wondering just what there is to do on Moreton Island, I'm happy to announce there is abundance of activities, a plethora of pursuits and a bevvy of bountiful shore excursions to entertain and excite. It just depends how much cash you have at the ready, and in many cases since you book them through the privately owned resort they aren't exactly cheap. Some of the most popular include the famous dusk dolphin feedings, ATV rides, whale watching tours from May-October and a litany of water sports that you'd expect at any island resort including jet skis, kayaks, parasailing and the like. If you're planning an action packed day, it's a good idea to plan your itinerary before you arrive so you can schedule everything before the boat's return back to Brisbane at 4pm. You can see the full list of day activities here. We spotted schools of sting ray and green turtles from the sides of our boat. At the resort's tour desk in the main reception area we booked a 1 and a half hour sand tobogganing and desert tour for the afternoon for $38 each. The Tanga Tours hut facing the beach is your go-to spot for all water sport. Our first activity of the day was a 45-minute fish feeding on a viewing boat that also toured the Tangalooma Wrecks and cost us $29 per person. Deliberately sunk in 1963 to form a breakwall for small boats and to encourage marine life and the tourism that it would bring, the 15 vessels in varying states of ruin offering a feeding point for fish and the best location for snorkelling. On our boat ride we spotted schools of stingray and several green turtles. The tour also provided commentary and a history of the Island as a whaling station. Unfortunately the cow-like dugong, which calls the waters of Morton Bay home and feeds on meadows of seagrass around the wrecks, remained elusive on our boat ride. As for the resort itself, while the location and grounds were beautiful, but I was left a little underwhelmed. Perhaps I'd been spoiled by the world class island resorts of Fiji and Vanuatu, and maybe my expectations were as such, but I couldn't help feeling as if the resort was a little dated, tired and devoid of character. Food options were not great, and price-wise everything was fairly exorbitant. Nevertheless, the resort seemingly caters to tourists who are willing to pay and appeared to be doing well, as the pools, food halls and activities were all packed. As we'd already worked up an appetite from the salt water and sun, we used our $20 voucher on a barbecue lunch, which was decent, if not basic. After grabbing food I'd suggest doing as much as you can away from the crowds of the resort, and finding your own patch of paradise on the 170-square km island. After our boat tour we spent time walking along the beach south of the resort where we eventually reached the 4km desert circuit. A clearly marked track from dunes led us up a steep hill marked with steps and which offered fantastic views back across Moreton Bay, across to Bribie Island and in the distance the Sunshine Coast's Glasshouse Mountains could even be seen. You can even make out the highrises of Brisbane seemingly rising up from the water. Quite the panoramic view to say the least. Those sweeping views need to be seen to be absorbed. We reached the sand dessert after about a 20-minute trek in the beating sun. It was quite a vista, seeing the expanse of rolling sand dunes appear through the scrub. This was also the place we came back to later than day for our dessert safari and tobogganing tour, but instead of hoofing it, we'd be in the air condition comfort of all terrain coaches. For the tobogganing itself, the resort provides planks Masonite wood, with a shiny surface on one side and a rough surface that grips as you lay on. It's not for the faint of heart, as you glide down the face of the 90m sand mountain which are apparently some of the world's tallest stabilised dunes. You can go down as many times as you like, but the climb back up is gruelling. Still, the rush of whipping down the face of a mighty sand dune was exhilaration at its best. If you have your own toboggan there's nothing to stop you visiting the dunes on your own for free via the Dessert walk. Next time we visit Moreton I'll probably avoid the resort and the activities altogether, and explore some of the many other bushwalks, bring a picnic or even considering an extended camping trip by bringing a 4WD drive over to the island. 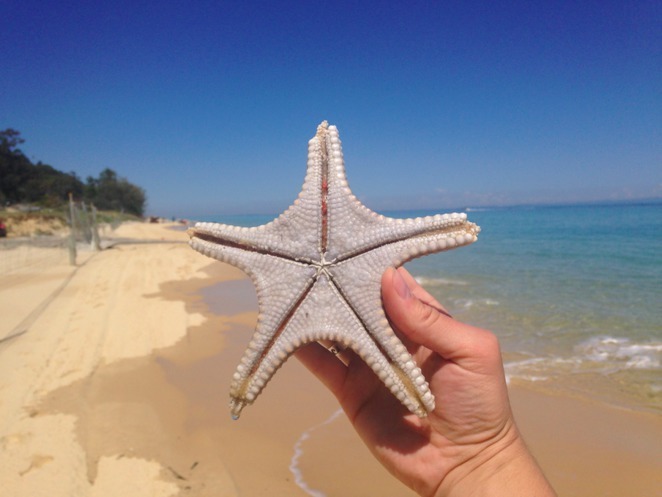 For those looking for a beach break and a taste of the tropical island life, the resort's facilitated excursions are a great way to orient yourself with the surroundings on your maiden sojourn to Moreton Island. Find your own slice of paradise and explore the island's pristine beaches. One thing was certain. After more than 6 years living in Brisbane, it was the definition of a delightful day trip. With crystal clear lagoons and swaying palm trees, I felt worlds apart from the everyday, and had discovered what felt like foreign surrounding. I could have been overseas, but here I was, just 40kms off shore achieving a sense of separation from the routine day-to-day, that I didn't think was possible. Cost: $65 return fare aboard the Tangalooma Express ($40 for kids) - includes $20 lunch voucher. Congrats on the gold- you covered some good points such as the length of time on boat and options for the day. I will be making a short trip to Brisbane soon for a somber occasion and this would be ideal to lift my spirits. I have always wondered what was over there on the island. At my age I won't be hitting those enormous dunes. I would like to go off and explore the walking tracks as you suggest. Looks really beautiful...wish we had one in Melbourne!